Whether you play four tables or twenty-four, TableNinja will change how you play poker by giving you the time-saving features that pros need to win. 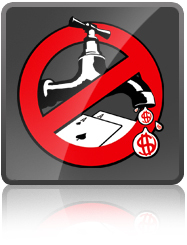 Concentrate on making winning poker decisions while TableNinja handles the rest. TableNinja will simplify and accelerate every aspect of your poker experience, by automatically opening tables, managing wait lists, computing bet sizes, managing sit-n-go registration, handling your time bank, providing hotkeys, and so much more. 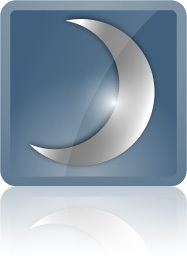 Compare TableNinja II Versions: Pro (All Sites), Pro (Stars Only), Standard and Lite. Whether you play cash games or Sit-n-gos, TableNinja will get your session going and keep it going for you by opening the tables for the games you play and keeping them open. NinjaVision lets you stay on top of every hand no matter how many tables you play. Watch the demo video to learn more. TableNinja automatically computes customizable bet sizes for you and lets you take any action at your tables with your gamepad, keyboard or mouse. All In! Snap shove with inhuman speed like a true Ninja. 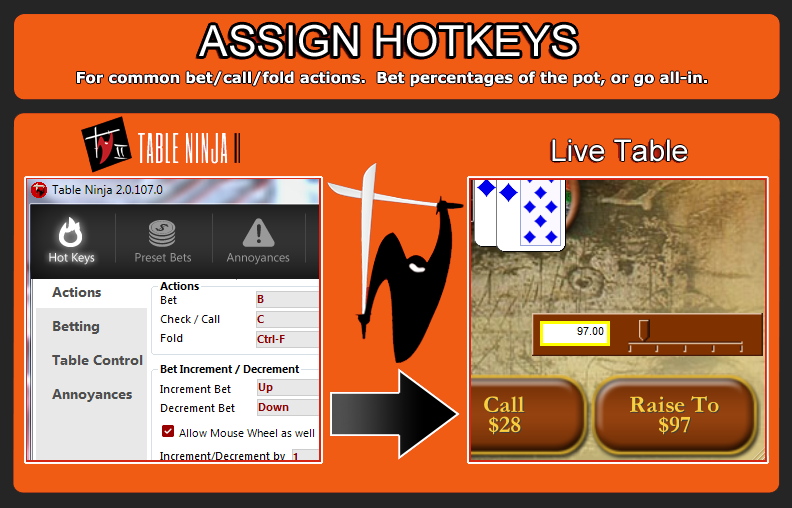 Assign Hotkeys Avoid mis-clicks and speed up your play with hotkeys to bet/call/fold, bet percentages of the pot, or go all-in. 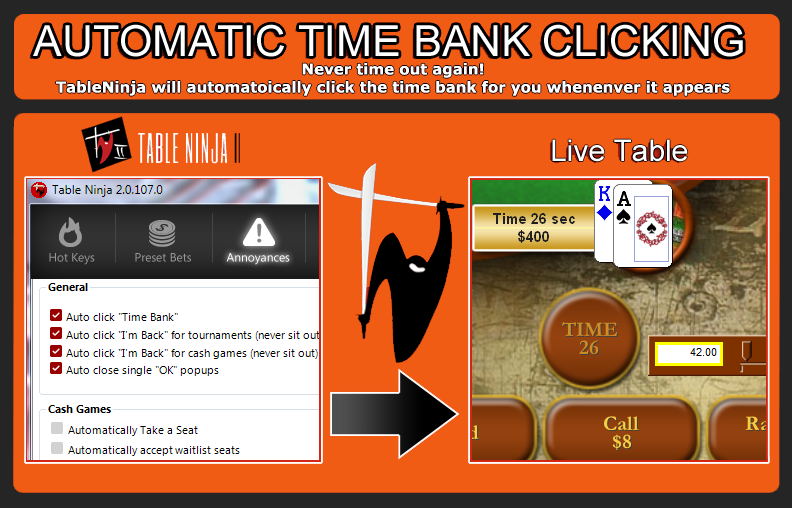 Automatic Time Bank Management TableNinja automatically handles other annoyances like clicking I'm Back, Time Bank and more. 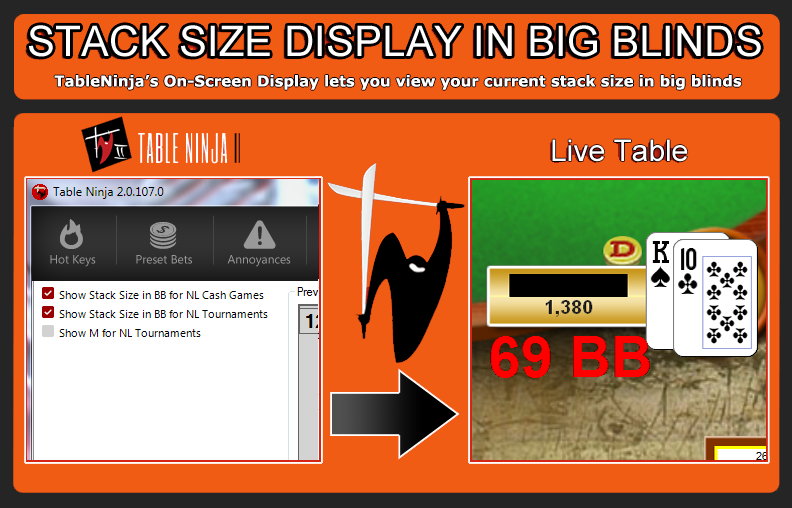 Measure Your Stack in Big Blinds Show your stack size in Big Blinds with our customizable On-Screen Display. NinjaVision NinjaVision lets you stay on top of every hand no matter how many tables you play. Watch the demo video to learn more. 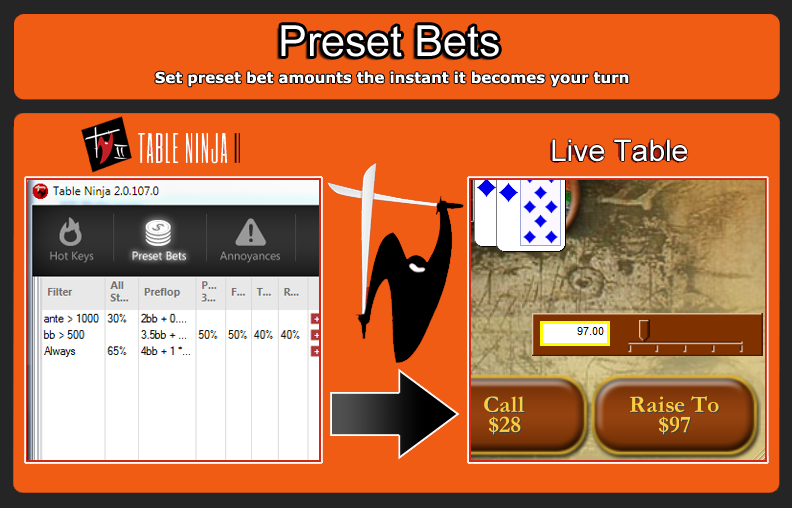 Preset Bets Preset Bets are customizable based on the street or even the tournament blind level. 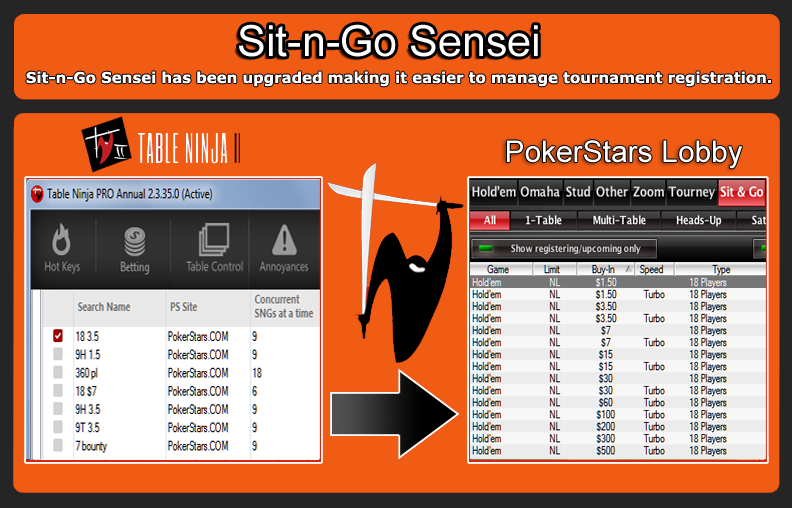 Sit-n-Go Sensei Sensei has been upgraded making it even easier to register for tournaments. Table Control Whether you stack, tile or cascade, our powerful Table Control tools give you complete mastery over your tables.test. 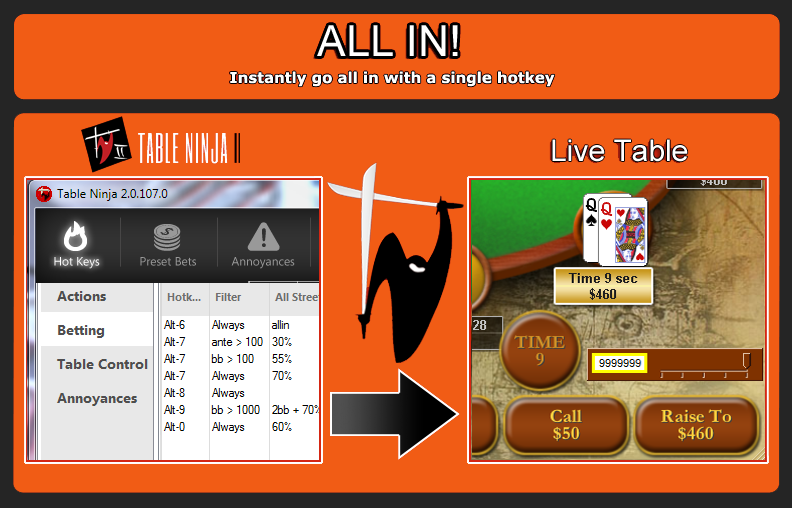 TableNinja II is a stand alone product and will work independently of Hold'em or Omaha Manager. You will not need to install Hold'em Manager or Omaha Manager to run TableNinja II.